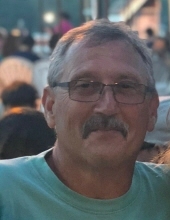 Jay Steven DeWitt, 61, husband of Patricia Ann (O’Brien) DeWitt, of Torry Lane, Stuarts Draft, passed away Wednesday, November 28, 2018 in Anahuac, Texas. Jay was born on February 5, 1957 in Waynesboro, Virginia, son of James Eugene DeWitt and Cleora Eilene (Campbell) DeWitt. Surviving in addition to his wife of twenty-two years, is his father “Jim” of Fishersville, his mother “Cleo” of Florida, his step-mother Judy DeWitt of Fishersville; a son, Dakota A. DeWitt of Bridgewater; three sisters, Faith Alderfer and her husband Ed, Bernice “Bernie” DeWitt-Witul and Denise “Dennie” DeWitt, all of Florida; two step-sons, Justin P. Harman and his wife Ashleigh of Stuarts Draft, and Jonathan L. Harman and his wife Emily of Waynesboro; a step-brother, Cody A. Harris and his wife Alena of Stuarts Draft; five grandchildren, Kahli Harman, whom he raised as his child, Nathan Harman, Emma Harman, Koley Harman and Korey Harman; two nieces, Jess and Jodi; three nephews, Alex, Caden, and Walker. Jay had many special people in his life, Maureen, Kevin, “Beav”, Bobbie Jo, and many of Kahli’s friends who Jay treated as his own. The family will receive friends from 6:00 p.m. to 8:00 p.m. Thursday, December 6, 2018, in the Coffman Funeral Home and Crematory. A Celebration of life will be conducted 2:00 p.m. Friday, December 7, 2018 in the Church on the Hill by Pastor Brandon Williams. Burial will follow in Augusta Memorial Park. It is suggested those desiring make memorial contributions, C/O Jay Steven DeWitt, to Truckers Final Mile, 3301-R Coors Blvd, Albuquerque, NM 87120 or St. Jude Children’s Research Hospital, 501 St. Jude Place, Memphis, Tennessee 38105. To send flowers or a remembrance gift to the family of Jay Steven DeWitt, please visit our Tribute Store. "Email Address" would like to share the life celebration of Jay Steven DeWitt. Click on the "link" to go to share a favorite memory or leave a condolence message for the family.